So my new phone case has arrived this morning, and I couldn't be more pleased with it! I wanted to do a quick review because not only am I happy with the case, but I received fantastic customer service in the process. Whenever I order anything personalised, I worry it will take ages to arrive. I sent my first message enquiring about the cases only 8 days ago, and received the case this morning, so I was really happy with the speed of the delivery. 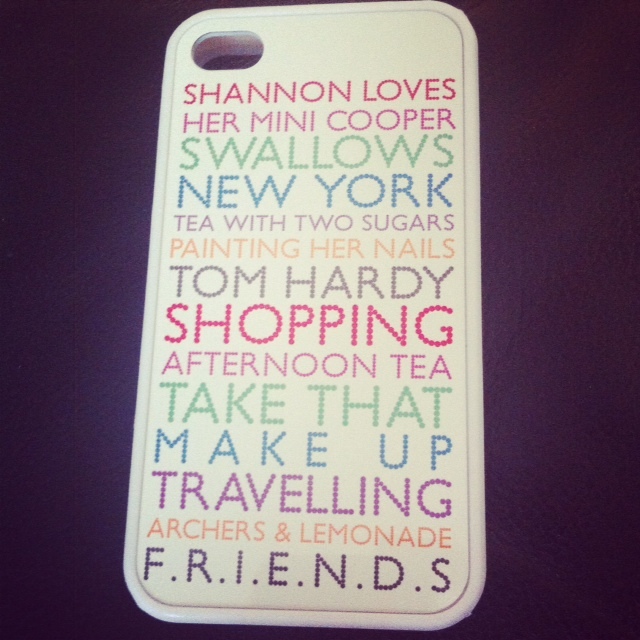 I purchased the case, and then emailed the seller with the list of my 'Shannon likes'. If you order one, and want your name on like I have, remember to include this at the top of the list. I know some people just have a list of things they like, and that still looks good. There was one or two things that I asked for that didn't make it on the case, but it didn't bother me. When I sent my list off, the seller contacted me to say it wouldn't all fit, and asked which things I wouldn't mind losing. I thought that was really nice, rather than just taking any off, for it to arrive missing some of it without my knowledge, or for it to arrive with EVERYTHING on all squashed in. When I purchased the case, I asked if it would be possible to have it printed on a rubber case. For some reason, I never seem to get on with hard cases. I seem to crack them straight away, even though I never drop my phone. I also have several marks on my phone where I've struggled to get plastic cases on and off. The seller was more than happy to order me in a rubber case specially. I paid £11.85 for this case, including postage and packaging. Considering these retail at £25.00 on notonthehighstreet.com, I didn't mind paying this at all. I purchased this case from 'ThatGiftSite' on www.etsy.com. Please let me know what you think of my new phone case in the comments below. Where do you buy your phone cases from?